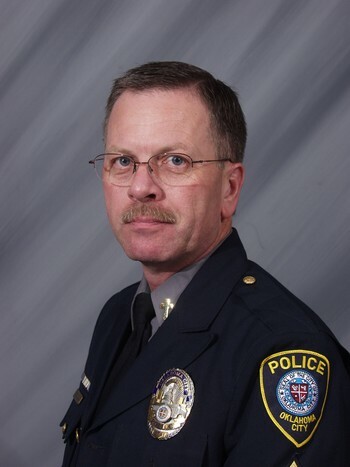 Greg Giltner is a police officer with the Oklahoma City Police Department in Oklahoma City, Oklahoma. I am a 21 year veteran with the Okla. City Police Dept. I spent 12 years in Patrol, 8 1/2 as a FTO, 3 years in Traffic and my current assignment is coordinator of our Peer Support Program known as CHAPPs (Cops Helping Alleviate Police ProblemS). We respond to all incidents involving police officers and/or their families. I am married to Vonne, a second grade school teacher and have 3 children-Clint-22, Haley-19 and Christopher-15. I am a Master Sergeant with OCPD and also serve as the Chaplain for our FOP Lodge. I had a routine physical on Oct. 28th 2008. I had noticed my left testicle had been swollen for quite some time, probably 8 months, but told no one. I was in no pain so I ignored it. When I asked the doctor to look at it at my appointment he immediately became concerned and sent me to have an ultra-sound. The unltra-sound confirmed a large mass in my left testicle so I was told to see a specialist the next day, a urologist. His diagnosis was that it was one of 2 types of cancer- either seminoma or lymphoma. I had surgery on Oct. 31st 2008 a “radical inguinal orchiecomy”. The results of the test came back in 3 days and I was relieved to hear that it was “seminoma” which is much easier to treat that the other. I started radiation in December 2008 and finished in January 2009. My oncologist says I’m free of, the tumor was 1 1/2 inches but will be doing cat-scans, upper chest x-rays and blood work for the next 5 years every 6 months. I was originally told I had a “good” cancer, which sounded like a oxymoron to me because all cancer is bad in my book. But having seminoma was the best of the 2 possibilities. My church and my police department were 100% supportive, but God blessed me with a christian wife 26 years ago and she became my strength and rock. She took off work to take me to appointments and radiation and never complained. She was beside me throughout this entire ordeal. When I felt down she lifted me up , when I complained she found a way to make me feel better. This role is uncomfortable to me because I am the “Cop” I am always in charge and in control. I was humbled when she stepped up and took over, my love for her is stronger now than ever before. I know my story is not a tragedy like so many others with worse cancers to deal with, but at 50 years of age this was devastating to me and my family. I have gotten through it because of my faith and family.